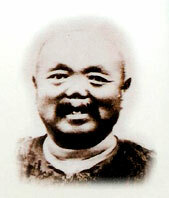 Li Tai Chi Boxing is the product of one Li Rui Dong (1851-1917). Before learning Tai Chi Chuan, Li was an accomplished martial artist starting his training in youth with Li Lao Sui from whom he learned Chuo Jiao (Penetrating Foot) and Fan Zi (Tumbling Boxing). Later he learned Tan Tui (Springing Legs) from his sworn brother in the martial arts, Wang Zi Fu (Da Dao Wang Wu). In 1880 a Mister Wang Lan Ting, a manager for the Manchu lord Prince Duan and also the teacher of Xi Xing San, stayed at Li’s house. Li discovered that Wang was a martial artist and, even more, a student of the famous Yang Lu Chan, the creator of Yang Style Tai Chi. After testing one another which resulted in multiple defeats for Li, a relationship began that was to last for a long time. First Wang taught Li the Yang Tai Chi. Next Wang had a friend of his, Hai Fan ( a Long Chan monk who practiced Secret Shaolin arts and Wu Zhen, a system derived from Gan Fei) pass on his skills to Li Rui Dong. Their next contact was a descendent of the famous folk hero, Yue Fei, who passed on the well known but generally unobtainable Yue Family Boxing to Li. After Yue Qing Shan broke the family code by teaching Li, he became a monk and left the mundane world. Mr. Li, now a matured martial artist, next encountered Gan Dan Ren (Pei Lan) who, like Hai Fan, practiced a style derived from the sword expert Gan Feng Chi. In this case Mr. Gan was Feng Chi’s great grandchild. He taught Li his “Nei Jia Ba Gua Chi men Chuan” (Inner Arts Eight Trigrams Style). There are many theoretical bases in Li Style utilizing classical Chinese philosophy. One of these comes from the San Cai (Three Powers of Heaven, Humanity and Earth). These are known as Tian Pan, Ren Pan, and Di Pan Boxing. They are also designated at Wu (Martial), Wen (scholarly) and Wen Wu (combined). Li Tai Chi 22 Moves: A condensation of classic moves from the main forms. Li Tai Chi Five Star Hammering Boxing is based on five major techniques of the famous “five fists’ of Yang style Tai Chi; namely: block and punch, fist under elbow, side punch, drop punch and punch the groin. It combines the classic actions of Tai Chi with those of Ba Gua and Xing Yi. Five Dragons Cannon Punch: Taking Five Element theory as its base the Five Dragons refers to the “organs” heart, liver, spleen, lungs and kidneys. Five Dragons twists like Ba Gua but shows the firmness of Shaolin. It has a definite martial base. Thirteen Li Tai Chi Sword Routines of which the soft and flexible Seventh Routine is very popular. Li Tai Chi Six Harmony Feng Mo Palm: The Feng Mo is a famous set. This Li version is of medium length but may be considered advanced. Combining the three levels it also unifies the five senses. It is a form that emphasizes “naturalness” and looseness. Li Tai Chi Thirteen Dan: From Li Rui Dong. This is a “wen wu” form combining scholarly softness and martial hardness. If is centered on 13 types of movements. Important structural concepts and energies include: San Cai (Three Powers), Five Element Hammering, Lao San Tui (Old Three Pushes), Si Men Pao (Four Door Cannons), Ba Da Jia (Big Eight Frames), Xiao Ba Jia (Small Eight Frames), Shi San dan (Thirteen Dan), Shi San Gan Ji (Thirteen Firm Frames), and more. Among their more esoteric theories is “Sheng Tai Pei Yu Hun Yuan Gong” The exercises of the Holy Foetus Returning to the Origin. Many Chi Kung as well as physical exercises are contained in the art. Posted December 21, 2009 by Plum Staff. Comments are closed on this post, but you can trackback.